The biosphere reserve is a coastal area located in the Massif de la Selle, in the south of Haiti, which includes the highest peak (Pic la Selle, 2,684 m) and the second most biodiverse region in the country after the Massif de la Hotte. 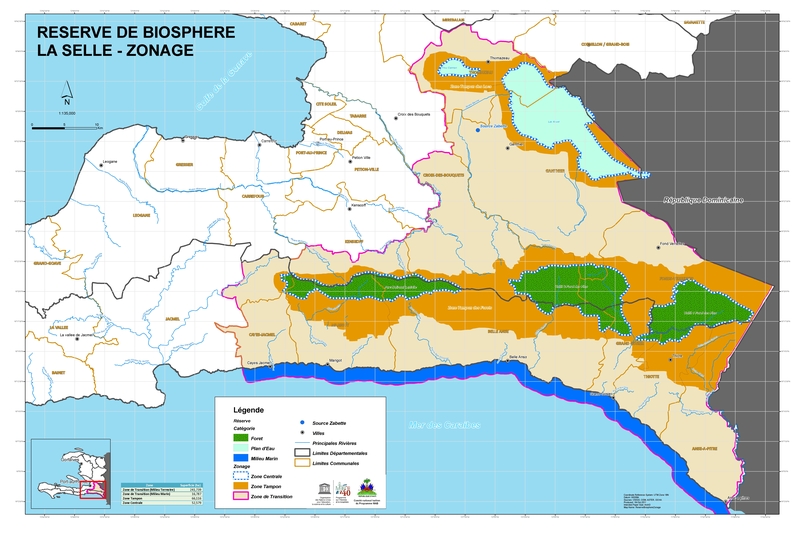 La Selle is Haiti’s first biosphere reserve. The area includes a large number of different ecosystems and protected areas like La Visite, which is one of the most important biodiversity sites of the country, and the forest reserve Forêt-des-pins, Haiti’s largest pine reserve dominated by the endemic pine species Pinus occidentalis. Important cultural and architectural traditions are preserved in the historic city of Jacmel, which is partially included in the biosphere reserve.